It's unclear whether California-headquartered Platinum Equity is buying the Detroit Pistons (as Fortune claims) or whether Platinum Equity's founder and CEO Tom Gores is buying the NBA team while Platinum is simply taking a minority interest in the franchise (as Crain's Detroit has stated). If the former is true, then the acquisition would mark the first time a private equity firm would be the majority owner of a major professional sports team; and, as result, the team would be held and run like any other PE investment: for a short term (about five years) and with one thing in mind: to flip it for a healthy double-digit return. If the latter is true (which does seem to be the case) then it simply means the ex-Bad Boys of Detroit would be owned by a billionaire who's among the top 200 wealthiest people in America and whose PE fund will have a minority interest and thus just a minor and not a major say in how the team runs its offense, defense, and personnel selection. 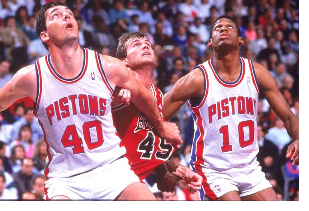 Either way, I say that with the native Michigander and savvy investor Gores at the helm, things are looking up for the Joe Dumars-led Detroit squad. Or, at least, can't get much worse for the Pistons, which are coming off three consecutive losing seasons. At any rate, in case you're interested, Platinum Equity says it "occasionally has openings for highly qualified individuals in a variety of disciplines" and "to be considered for upcoming positions, please e-mail [the firm's] human resources department with a brief introductory note." You can do so through the Platinum Equity website.